The word "Calamagrostis" is derived from the Greek word kalamos (reed) and agrostis (a kind of grass). They are referred to generally as Reed Grasses, with this one being the Korean Reed Grass specifically. Calamagrostis are robust rhizomatous perennial grasses, forming tufts of linear leaves, with erect stems bearing dense branching, flowering panicles in summer. There are about 270 species of these handsome reed-like grasses from northern and temperate regions. 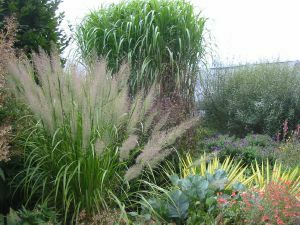 They are slow-growing, clump-forming grasses with feathery flower-heads that generally stand well over winter, making them sought-after garden plants. The flowers of Calamagrostis brachytricha make a show in September and go on well into winter. They form shaggy looking pointed columns. A soft purple with reddish tones they become paler with time so that, by winter they are silver grey. The flower-heads stand well above the grassy stems, and form a striking feature with their soft-looking upright spikes. This plant likes sun or part shade, but will need some moisture in brighter sites. It grows well in a container and it looks beautiful at the border front as well. Cut it back at the end of winter. The plant stands around 1.2m (4ft) high.